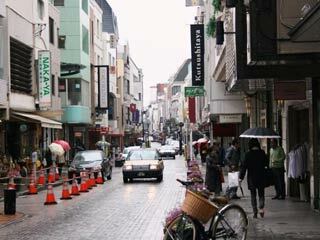 Motomachi (元町) is one of the most popular the shopping districts of Yokohama. Because of Yokohama port was the first international port of Japan after Edo Period, Motomachi was developed as the town for foreigners. Since then there are many shops opened for them and it became the fashion leader of western style for long time. Today, there are many fashion stores, and one of the hip spots in Tokyo area. Motomachi was the original place of Yokohama Village. It is the birth place of "Hama-Kaji" Yokohama casual fashion during 70's. Today there are many fashion shops and restaurants are open at Motomachi. Also, there are still many imported shops for food, furniture, and other glossaries. Kikuya is the sweet shop opened in 1924. Originally, their sweets was taught by foreigners, but later it became the most popular and favorite sweet shop in Yokohama.